Research is at the heart of the School of Art’s academic community. Our researchers are artists, makers, designers, curators and writers who work creatively and critically across contemporary arts practice and across disciplinary boundaries. They employ creative research questions, methods and approaches to investigate, for example, how we manage waste through sustainable craft and design, how drawing supports mental health and wellbeing, how we alleviate social isolation through inclusive art practices, and how we envision future cities through interactive digital communication. Our research explores how knowledge is produced, challenged and disseminated through materials and making, thinking and practice, with outcomes taking the form of exhibitions, installations, performance, curatorial projects, journal articles, book chapters and monographs. A main focus for the school is leading and developing interdisciplinary research activity and social partnership work both across the university and with external organisations, exemplified by the activities of the Drawing Research and Enterprise Group (REG) that it leads. We actively value and mentor both new and experienced researchers. We provide specialist supervision for doctoral study, including for students who wish to submit a combination of written thesis and art practice. Our annual Research Week involves the whole school, with students and staff exploring ideas together, nurturing research at all levels of education and career. In the School of Art, we believe that it is through research and enterprise that we continue to develop pioneering, creative, entrepreneurial, critical and experiential approaches to the arts. It is through research that we produce new knowledge and make a difference to our local community and to the wider world. 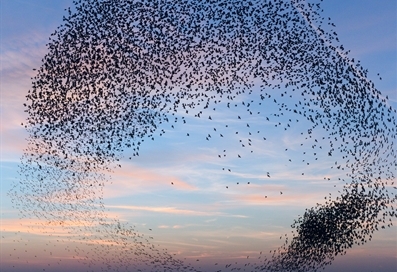 Image credit: Christopher Stevens, University of Brighton School of Art, Murmuration of Starlings over Brighton (detail). Rawle, G., 2019, 13 March 1911. Morris, S. (ed.). York, England, 1 p.